I like pies. I like ginger. I like creme brulee. 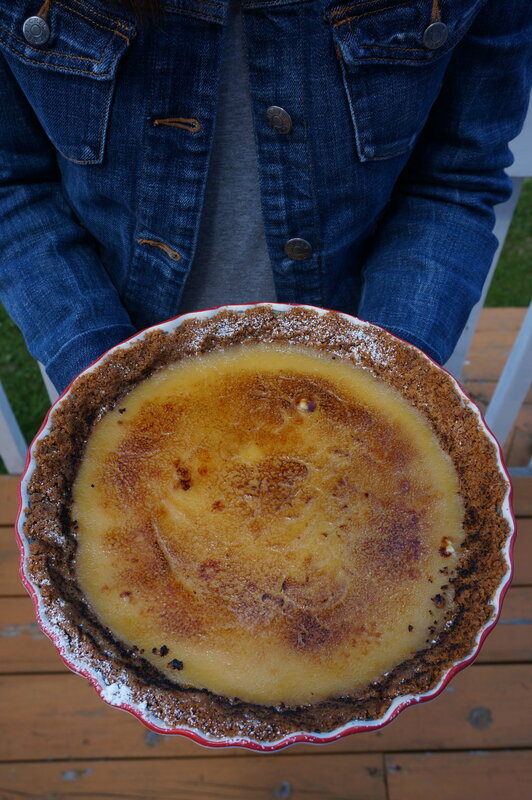 I see a recipe for ginger creme brûlée pie from The Pie Project and immediately bookmark it for a future blog post, and now is the time! Honestly, this pie is not photogenic, but it is quick and easy, and it gave Ken the opportunity to play with fire: torch the sugar. Every step of the process made us even more hungry - from crushing the ginger snaps to adding the ginger candy to the filling. The one unsatisfying feeling from this recipe is the lack of a lattice pie crust. It feels weird not seeing the lattice detailing and making the pie look pretty. Before we torched the ginger brûlée pie, the pie looked naked. This feeling only means there will be more pies to come in all types of fillings and pie crusts.